Pre-war debutantes were members of the most protected, not to say isolated, stratum of 20th-century society: the young (17-20) unmarried daughters of the British upper classes. For most of them, the war changed all that for ever. It meant independence and the shock of the new, and daily exposure to customs and attitudes that must have seemed completely alien to them. For many, the almost military regime of an upper class childhood meant they were well suited for the no-nonsense approach needed in wartime. 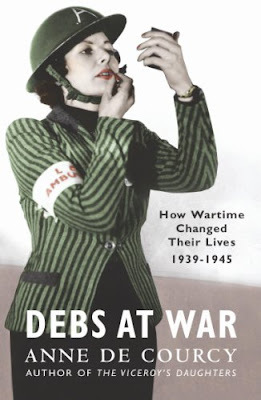 This book records the extraordinary diversity of challenges, shocks and responsibilities they faced - as chauffeurs, couriers, ambulance-drivers, nurses, pilots, spies, decoders, factory workers, farmers, land girls, as well as in the Women's Services. How much did class barriers really come down? Did they stick with their own sort? And what about fun and love in wartime - did love cross the class barriers? I had this on my (ever growing) "to be read" pile for an age and decided that whilst I was still in factual mode - I would give it a shot. And I have to say that I am pleased that I did. I think growing up in the UK, gives you a sense of "us and them" when it comes to the class divide. It is kind of always subliminally there. Well it is to me anyway. So I was interested to read what the "upper classes" contributed to the war effort. And I have to say - a great deal! The book is well researched with lots of lovely pictures so you can put a face to a name, along with easy to read and digest information. This book goes to show that these ladies were more than happy to replace the silver spoon with a pitchfork, spanner or aircraft manual. A top drawer 7/10 from me. Good luck with the new blog. I'll look forward to reading more. Looking forward to your review of The King's Speech! I can tell that this is going to be a fab blog - you've already reviewed one of my favourite WWII books. Can I be cheeky and suggest the Nella Last books compiled from her wartime and post war diary entries to Mass Observation? They're completely brilliant. Oh, and if you haven't already, check out Persephone Books as they print both non-fiction and fiction set in WWII England - 'To Bed With Grand Music' by Marghanita Laski is a must!! Darren - going to see it this week! VK - already in draft! Thanks for the suggestion though! And Persephone Books eh? On it!